Image: Danny Broersen. // With the race foiling frenzy post Americas Cup, plus the drive from from other beachcat projects like the Flying Phantom, Nacra decided to upgrade their flagship F20 Carbon to play in this new flying game. A foiling 20' for a company like Nacra is like the Corvette, a niche aspirational product and a good marketing move to promote the brand. Every kind of sailor has their targeted Multihull, so analyzing these boats (along the FP) as if they will create a class or they will sell for the hundreds is nonsense. The real deal here is to develop and literally play with latest technologies, offering interested customers a Flying ride for their money. As the Americas Cup has fallen into the Multihull realm for good, projects like the Nacra FCS are of great interest for the major leagues as shown with the FP and Oracle head coach, Philippe Presti. Nacra puts another production racing foiler available to all with the wallet to buy it, although I have not seen pics or videos of the final production boat, the one above is published in their FB page, they already have confirmed orders. I've been talking with Fer van West for a while, and some weeks ago he told me the FCS project was ready be to launched. Peter Vink, oNacra / Performance Sails head manager along Gunnar Larsen, sent the FCS renders some weeks ago, so I took the chance to know more about the F20. Peter talks on the commercial aspects, and Ferdinand goes full in detail on the technical aspects. Congrats to Nacra again for pushing the limits and supporting young designers like van West. Fer has left his sailing career (49er & a too close call for the F18 Title in 2010 with Hugh Styles) to follow his design goals, and now is working along one of the major design studios in the industry like Morrelli & Melvin. More on MM after AC35 rules are published. 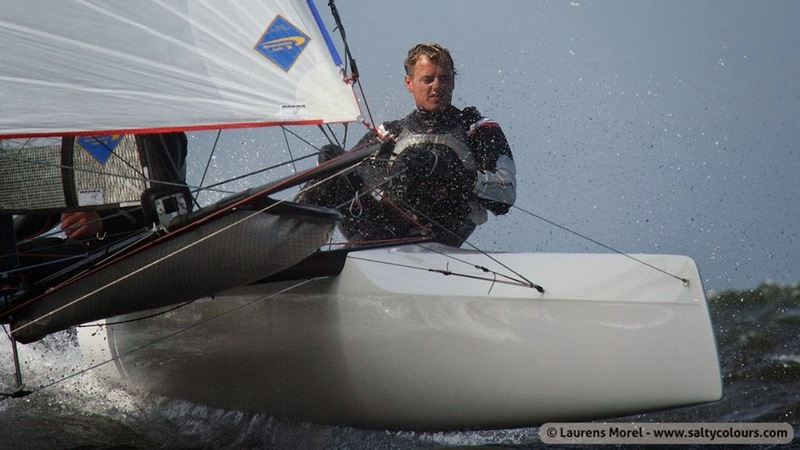 -CSN: When Nacra decided to launch a production foiling 20? - When the boat will be available for the customers? - Which is going to be the price range? - Are you selling an upgrade kit? If so, any modifications will be needed to older boats? Yes we are, Many Nacra F20 carbon are sold worldwide and we offering an upgrade kit for these customers. The upgrade kit has also a new dagger board case and instructions how to install these new cases. - How about the boat construction? Has it changed from the previous version? I have reports on high loads for the Flying Phantom tests and the new flying A-Cats. The curved foil design boats are already pretty much dealing with these loads when the boat is sailing max powered up and is sailing for ~90% on the foils, like the Nacra 17s skimming over the water downwind. These high dynamic loads are now becoming more constant static loads, so we made some small updates around the dagger board case to make sure the boat can handle the dynamic loads plus the more constant static loads in full foiling mode. - Are you guys going to the Eurocat? If not , when the boat will be launched at a long distance event? We will be in Carnac but it will be too soon for the Nacra F20C FCS. We expect to receive the first production foil sets end of April or beginning May, just not in time for Carnac. - Are you doing the Texel 2014 with it? Already 8 of our FCS customers entered the round of Texel so we will have a small one design Nacra F20 Carbon FCS fleet at Texel. - Who worked on the R&D ? - Little background on how you left racing and end working for Nacra and MM. 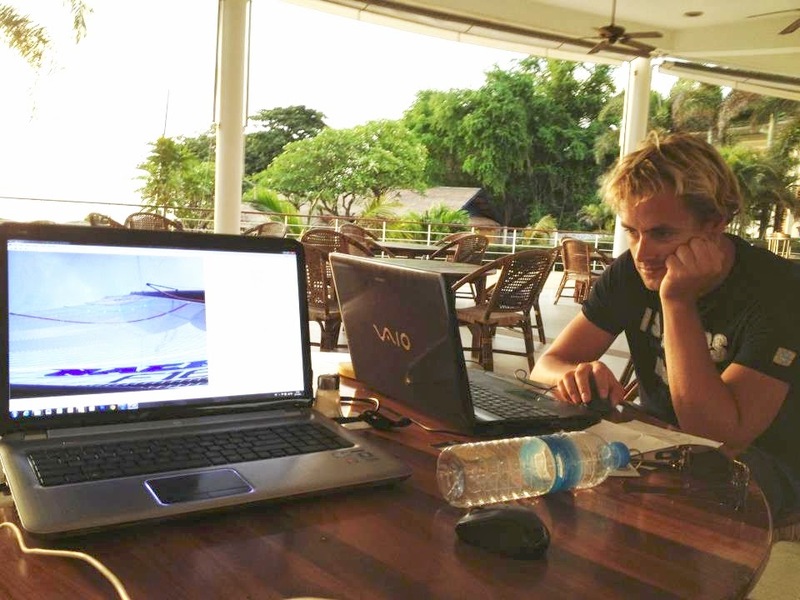 Fredinand van West: After sailing the 49er and the Nacra F18 for several years, I decided to get my master degree in Maritime Engineering at the University of Southampton, in 2011. I graduated in Yacht and small craft, and my dissertation was about the structural analysis of the Nacra F20 carbon C-curved Foil, which I did in collaboration with Nacra. 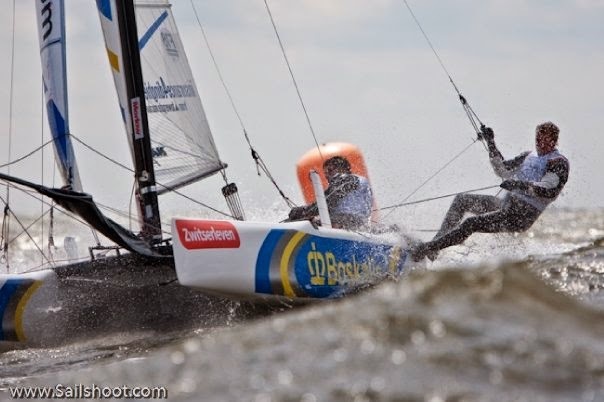 Since 2008 I have been sailing for Nacra in Team Boskalis. I was also involved in the development of the Nacra Infusion MK2. Peter Vink got me more involved with the technical development of the newer projects so I ended up working part time for the company on various projects since 2010. After graduating in Augustus 2012, Nacra offered me to get more involved with the Nacra 17 project. At first on the Class related tasks, and later I got more involved on the technical side. Through Nacra I got in contact with Pete Melvin and one thing led to another. - How you do achieve control and safety rides, making it that simple? The F20c will feature rake dynamic controls as the FP or the Hydros, that has a more complex setup? At Nacra we have a couple of company principles called Plug & Play and KISS. Our goal is to make the systems as simple as possible, to operate and to maintain, but at the same time efficient for the best performance. - Have you moved forward the daggercase? If yes, why? Yes we moved the dagger board case a bit forward for a better balance between the hydro and aero forces. We believe you don’t want to have the board to far forward, because you want to keep the pressure on the foils which gives you better control over the boat. At the contrary, it’s also important not to place the dagger board case to far backwards, for the couple moment between the foil and the elevator. Also you want enough separation to prevent distortion at the elevator caused by the main foil. - How do you fit the L daggers in the new F20? The FCS foils have to be fitted in a new designed dagger board case through the bottom slot. It will be also still possible to fit a curved board in this new dagger board case. Just with the change of the deck and bottom bearing. Couple of bolts, that’s all it is. - Which is the projected learning curve to foil? Any limit on Wind/Wave range conditions? We started testing mostly in waves and in the upper range wind speed. We were sure that this was the biggest challenge to make a stable FCS system so we spend most of ore time on the water in these conditions. We first started with stabilizer fins on the standard rudder and made an special C foil with a tip that we further developed to get a better heave stability. The limits are more or less the same as a normal Cat. We found that full foiling is surprisingly easy until 15 knots, above this wind range you need to develop your foiling skills and get some experience how to sail a boat like this in these conditions. It is a new way of sailing that needs different skills, so time on the water is king. - After TNZ impose the 3 foil system, many have follow suit, including smaller cats like the FP , Cammas / Hydros Class and now the F20.At first glance they look like a scaled replica of the ones used in the 72. How was the process to develop the FCS, and which changes/features are specific for this size of cats? The Nacra F20 Carbon FCS uses indeed foils similar to the Cup boats and the fully foiling C-class boats, a passive adaptive solution to achieve stable flight, this is primarily provided by the foil going as a V-shape through the water. This means that the tip of the foil is angled that it is pointing up and piercing time to time through the water surface. Seeing the Cup boats foiling, we got interested to apply the same kind of foils to the Nacra F20c. At first we wanted to get a better picture and experience what fully foiling was truly about. So we took a closer look at the C-class and Cup boats. Then we build different prototype boards to see how far we could get with a pretty basic configuration, but also to learn how much more would be involved regarding the structural side of the foil. One of these foils ended up to be pretty good, from which we could get some valuable data for the further design process at Morrelli & Melvin. Morrelli & Melvin has a powerful tool to analyze these foils in computer simulations. This software package, specially developed for fully foiling foils, was a great tool to have with this project and made it possible to develop an optimize the foils for the Nacra F20 Carbon FCS. It seems a 20ft cat has less static heave stability than a 72ft cat, however the crew / boat weight ratio is much better. Therefore it’s possible to shift the center of gravity much quicker, which is quite dominant in regards of boat balance in Full Foiling mode. 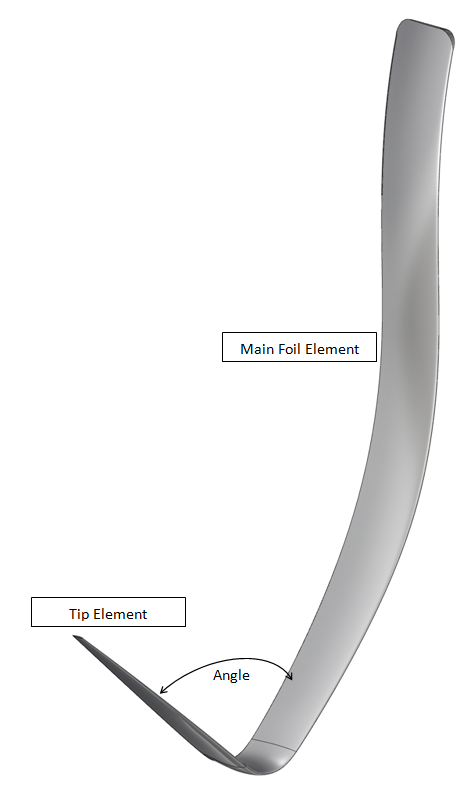 Besides this, you can achieve better control with foil design itself, primary by closing the angle between the tip and the main foil and by making the tip longer in length. To give you an idea how sensitive this is we added two graphs below. Both graphs are from a basic heave stability analysis of three different foils of which the main foil element is fixed, (kept the same) and only the angle between the tip and main element, and the length of the tip, has been altered as highlighted in the legend. In the computer simulation we could simulate the NF20C FCS travelling in equilibrium at 30 knots of boat speed at a sink of 0.4m and the optimum trim settings of the foil. (Sink refers to flight height above water from DWL) From this Base Run, the sink would only then be varied, and these different sinks points could be plotted out in the graphs above to examine the heave stability. The two graphs above show two primary quantities, firstly the heave stability, a derivative of vertical lift and change in sink and the second graph shows the total drag of the board. Basically you want the sloop of the first graph as steep as possible for better Heave stability and the second graph as low as possible to be faster. Both graphs together show the tradeoff between heave stability and drag. 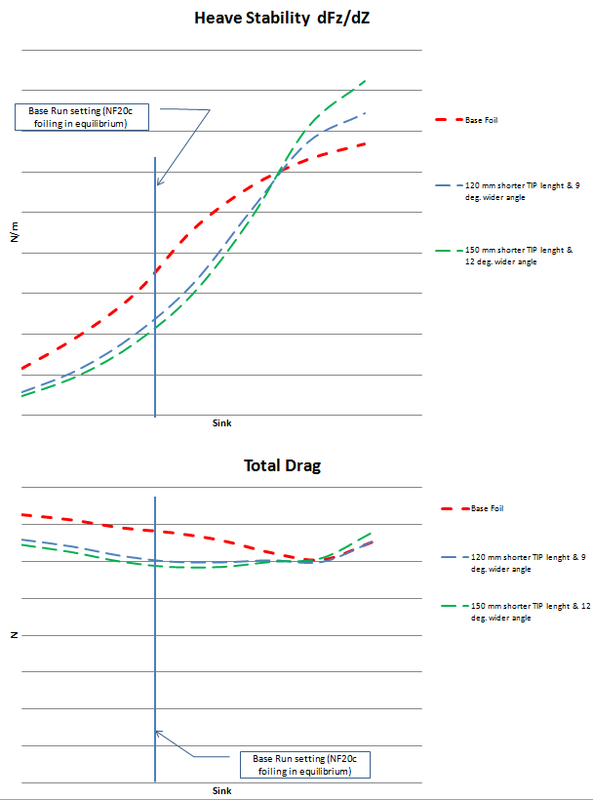 For example, in these graphs a wider angle and shorter tip could give up to 11% of less drag, which is a significant gain. However, at the same time your heave stability is 30% less as well, making the foil less controllable or say sailable. To get to the optimum design requires further analysis of many other characteristics and many foil design iterations. Besides this it was also very important to build up the right reference frame from foils with sailing experiences, to be able to better understand the real-world tradeoffs when a foil is sailable or not. - What do you think about the A-Cat 4 foil setup? Can the FCS be applied to an single handed racing A in your view? Yes we think an FCS will make an A more stable, we don’t see why it couldn’t work on a single handed cat. The boat/crew weight ratio is better and is moved by only one person, so that is an advantage. - Once you have 18-20 footers airborne with a similar or even equal foiling system, the final performance might be provided by the rig & width. How is the F20c equipped in this area compared to the FP? You are right on the rig & width, There the Nacra F20 Carbon FCS has a big advantage with more beam and a taller rig with a significant bigger sail area. Keep in mind that the hull shape is quite important too during the transition between NF and FF mode. This is an advantage of the F20c, as these hulls were designed to sail in semi foiling modes with an curved foil. This also will be beneficial for the transition between these modes. But it is too early to draw any conclusions in how even or different all of the flying boats are today, time will tell. All what we will do is provide the sailors with a king of the water solution” so that they will come of the water with a very big smile. We are talking about not just providing a sports car here, but a true supercar, sailing boat in this case. and the hard launch process? It was an enormous and exiting undertaking what we did together with our suppliers. Having now more than 70 boats sailing in Palma and 83 in Hyeres this year is mind blowing for all of us. Having so many boats and organizations that need to close their entry’s lists, makes you proud to be part of such sailing class. - How many boats expected for Santander Worlds? Looking at the current entry lists on Palma and Hyeres we expect that it will be the max 80 boats that is allowed. 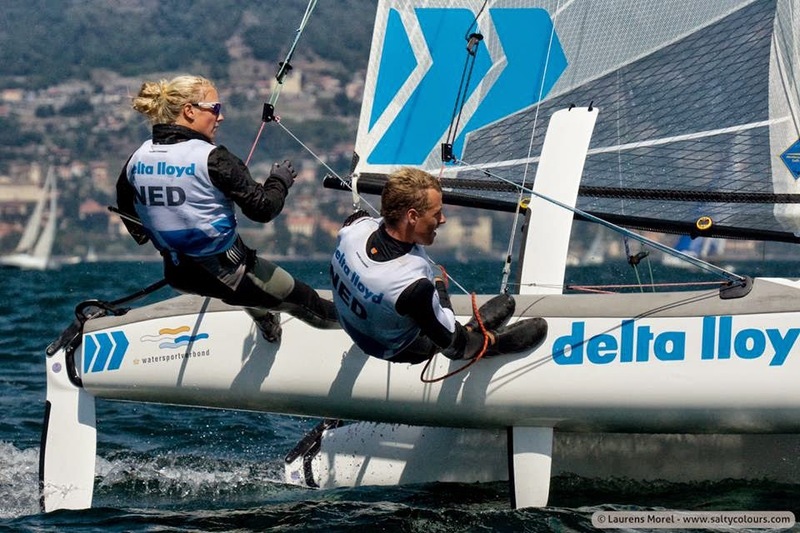 What we see now is that the Nacra 17 is getting more and more in to the Sailing clubs outside the international racing, what will bring more sailors in the international races. When ISAF decided to go for an mixed crew there where many people in the sailing world saying that this would not work. We can tell you now that this decision is a big success, not only you see it in the numbers on the entry lists it is also noticeable when you are on the boat park by having a great atmosphere. - Might the N17 be flying in 2020 Olympics? Any further devel being done on the boat? Winglets? Olympic class can evolve and stay up to date and how relative smoothly this was implemented. Nacra is ready when ISAF plus the Nacra 17 class are ready for a full foiling Nacra 17. 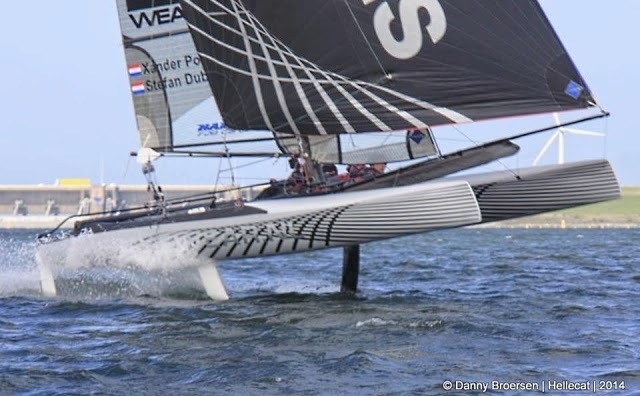 However, it is still early days regarding the configuration of fully foiling with catamarans. N17 launch, we reported about the hard work on launching and keeping the project together, how was that experience? The Nacra 17 project was a great experience, as the company and everyone involved reached higher levels by pushing boundaries. It is pretty rare that a new class grows so quickly, as being selected for the Olympics, and therefore it was challenging. 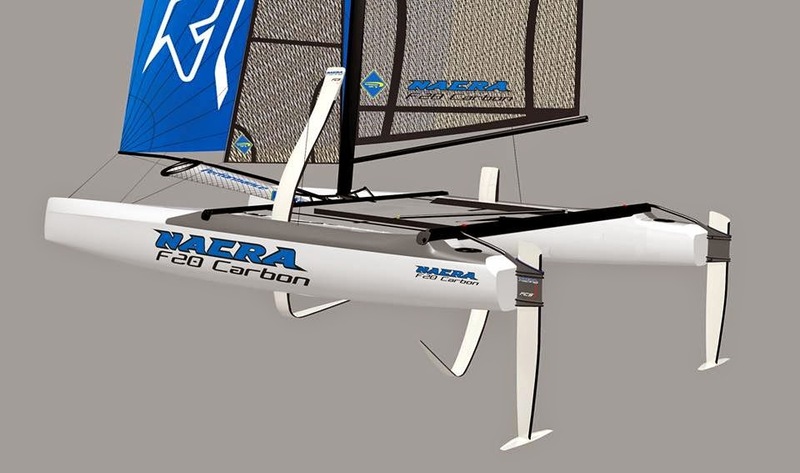 In May 2012, the Nacra 17 got selected after two prototypes were tested during the ISAF trials. From that moment a full production needed to be set up in only 6 months’ time. We can tell you that setting up a production line for at least 300 boats in one year, is quite a challenge. The new Nacra 17 carbon mast with from Hall Spars, which were the goals of that project and what was tested? If you look at all the components of the Nacra 17, the mast is a pretty dominant factor in regards to the one-design integrity of the class. Starting with a clean sheet at Hall Spars, we focused on the right combination of the performance characteristics, reliability and one-design (Quality Control). These three components strongly interact with each other and together we found some good solutions to achieve a well performing mast, which at the same time can be pushed by the Olympic sailors, which they definitely do with the entire boat as we experienced. Several masts were built to match the right stiffness characteristics for the already exciting mainsail, by which we used sensors to measure the strain on various key positions along the mast. Once we found the optimum design we tested to mast on various impact scenarios, and validated the data with several destructive tests of the this mast before we started production. - How about the F16, any upgrades ? - Which devels are left once you have the boat flying? of course fine tuning and control will be improved, but is there any left area for a quantum leap in performance as seeing with the foiling? Sure, fully foiling opens a new world in regards of development. For example, you could come up with many shapes and configurations, where the tradeoff between performance and sailable quite dominant is, which again relates to how efficient you can operate your control systems. Finding a nice solution with foil sections, regarding the cavitation issues at speeds of +40 knots in order to break through to the 50s and 60s like the Sail Rocket project did, could be called a quantum leap in performance. We think the full foiling development is great for the sport, which really could give sailing a new image. This leaves us the other challenge, how can we keep sailing affordable? Keeping sailing affordable is high on the agenda for us. We are working on some interesting concepts and ideas. This is something we really hope to achieve, and is more related to the innovation of the production processes and challenged by keeping the weight down and the performance and quality of the boat up. One of these projects is an new small Nacra that also fits perfectly in the new criteria for the new youth multihull that ISAF asked us to come up with.